This book is an unflinching and deeply personal rendering of the emotional turmoil encountered in healing from trauma that is both physical and spiritual. 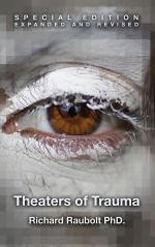 Both the general reader and the professional therapist are invited inside the consulting room, of a master clinician, to witness the theater of trauma where dramatic pain, fear, and despair are enacted side by side with courage, honesty, and resiliency. This compelling volume presents trauma recovery in a unique style that is both powerful and refreshingly free of psychological jargon. Readers are encouraged to form their own interpretations. Finally, this is a book of experiences not recycled "how-to" steps or inspirational, simplistic answers to very real human dilemmas found in every day living.